Whenever anyone asks what my favorite part of Thanksgiving dinner is, I always answer, “The leftovers!” I love spending to next couple days nibbling away at the stash of goodies. One of our favorite ways to have leftovers is to transform them into something else, like a wonderful Thanksgiving Turkey Melt sandwich. 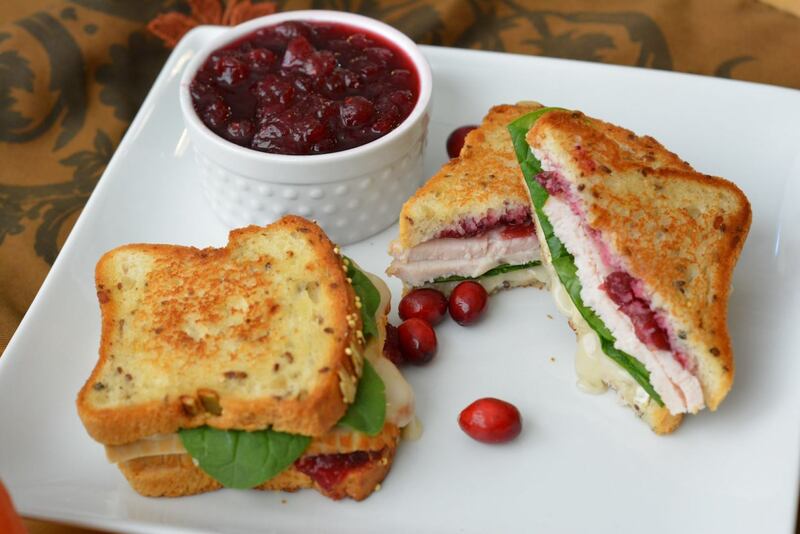 Built on Three Bakers Gluten Free Great Seed Bread, this sandwich has all the Thanksgiving flavor components: savory turkey, creamy brie, and tangy cranberries. If you eat dairy free, skip the brie and add slices of avocado instead. Dividing between two unbuttered sides of two bread slices, spread cranberry sauce on bread. On top of cranberry sauce next layer turkey, brie or avocado, and spinach leaves. Top with each sandwich with a second slice of bread, buttered side up. Place sandwiches in a preheated skillet, cooking until bread is golden. Use a thin spatula and carefully flip sandwiches to grill other side. Cook until golden, cheese is melted and ingredients are heated through. Serve warm. Want more delicious gluten free recipes? Find them here.